During 1933 a mixed traffic locomotive was delivered to the PLM Railway in Algeria. It's design was similar to a locomotive recently delivered to the South Manchuria Railway. The mechanical portion was provided by Cie des Forges et Acieries de la Marine & d'Homecourt, the electrical equipment & electro-pneumatic control equipment was provided by Soc. Gen de Constructions Electriques (Als-Thom). A factory portrait of the machine, for the other side of the locomotive, see the view below. An eight cylinder 8LV31 pre-combustion chamber Sulzer engine with an output of 750hp at 620rpm was mounted on the main underframe and directly coupled to a d.c. generator. Two additional output settings were available to the engine, 625hp at 540rpm and 520hp at 450rpm. Cylinder bore and stroke were 12.2in & 14.5in respectively, the weight approximates 35lb per hp. Cooling of the water and engine oil was effected in gilled-tube radiators situated either side of the engine room. Roof mounted electrically driven fans pulled air through the radiators and exhausted through the roof. The cooling water pump was electrically driven, the lubricating oil pump was geared to the engine shaft. A battery was provided for starting the engine and other purposes. An auxiliary generator mounted on an extension of the main armature shaft provided current for controlling the excitation of the main generator windings and other purposes including a brake air-compressor motor and charging of the battery. The four nose suspended series type traction motors were coupled permanently in parallel. The standard PLM Westinghouse-Henry braking system was used, with brake blocks on all wheels, the air brake cylinders were mounted outside of the bogie frames, the air reservoirs were slung under the frame between the bogies. The sanding gear was also air operated. A speed recorder and Isothermos axleboxes were fitted. On trials over PLM tracks in France with a trailing load of six wheel carriages totalling 150 tons 56mph was achieved on level track, 42.5mph on a gradient of 1 in 200. Duties in Algeria were to include haulage of suburban trains between Algiers & Blida. From an article in Diesel Railway Traction December 29 1933. 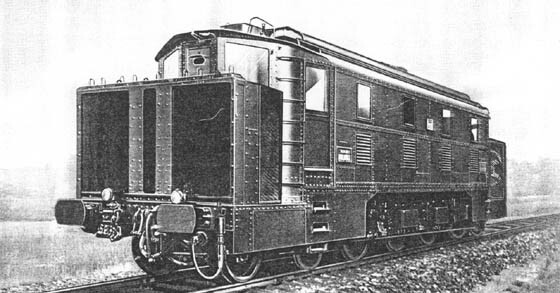 In 1933 a 2-Co-2 locomotive was put into service by the PLM railway on its Algerian network. It was powered by a MAN 920hp engine, weighed in at 100 tons with a top speed of 72mph. Operation for some years was over the Algiers - Oran route. When new it was tested between Paris & Marseilles, covering the 536 miles including station stops in 9hours 35mins at an average speed of 56mph. This was a high speed test and the load consisted of just two coaches. In light of its use in the hot Algerian climate either end of the locomotive was adorned by radiator panels and fans, giving it a somewhat unusual appearance. Periodic troubles with the MAN engine led to its replacement by a pair of pressure charged Sulzer 6LDA25 engines. Each was nominally rated at 735hp at 830rpm, but for the conditions in Algeria they were derated to 650hp continuous, giving a combined output of 1,300hp. Each engine-generator set had its own auxiliary generator. Alsthom, the original builder of the locomotive undertook the rebuild. Locomotive weight increased to 105 tons, top speed was marginally increased to 77mph. A modification to the roof allowed for removal of either engine-generator set without disturbing the other half of the roof. The rebuilt locomotive went into traffic in May 1941, but an accident shortly afterwards kept it out of service for a considerable time. After repair it operated on the Algiers - Bougie service, using the east main line to Beni-Mancour, then down the 54 mile branch to Bougie, maximum altitude on this line reaches 1,000ft. It is reported that the locomotive was finally scrapped in 1958 after a life span of 25 years. From an article in Diesel Railway Traction, July 1951. & a brief note in Diesel Railway Traction, August 1959. In 1947 the first of sixteen railcars were delivered to the Algerian Railways. All were powered by a 6LDA19 pressure charged engine, produced by the CCM-Sulzer works at St Denis. Nominal horsepower was 420 at 1,100rpm, but for the Algerian installation this was reduced to 400hp. Two of the metre gauge railcars are seen in the Oran area. The four built in 1947 by De Deitrich weighed 34 tons loaded with a maximum speed of 65mph. Four more followed in 1949, their top speed was reduced to 56mph. Four more delivered in 1950 had a maximum speed of 50mph and were built for the metre gauge lines. Four more standard gauge units arrived during 1951, identical to the 1950 build apart from the gauge. These units have a driving cab at only one end, so were most frequently run in pairs. In any combination they are able to haul other rolling stock. The four metre gauge fourgons were used on the Biskra - Toggourt line. This line also utilised the two 1939 De Deitrich built fourgons, one of which was powered by two Sulzer 300hp engines. All eight of the 1,055mm gauge sets were based at Perregaux handling the local work from Oran to Ardzew & Mostganem. Also worked is the 465 mile Oran to Colomb-Bechar route. Among these duties is the locally named 'Express du Sud', train 2001 southbound taking 17hours 54minutes & train 2002 northbound taking 17hours 31 minutes, which included about two hours of station time. The 'Express du Sud' often included four passenger coaches as the hauled load. Average yearly mileage was 85,000 to 95,000km, though some have reached 115,000km. these railcars were later rebuilt for the 1000mm gauge and renumbered YZZDN 113 to 116. A publicity view of one of the Sulzer powered railcars, not details, even the identifying number has been partially removed. Based on an article in Diesel Railway Traction, June 1953. A side view of the Sulzer powered 'fourgon'. During 1951 five bogie 'power vans' were introduced on the standard gauge section of the Algerian Railways (Chemins de fer Algerians - CFA). The installed power of 1,470 hp was obtained from two Sulzer engines and was equivalent to the capacity available from the more traditional style of mainline diesel locomotives. 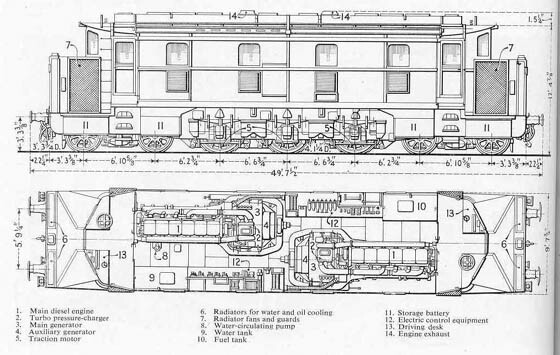 Two Sulzer 6LDA25 engines were direct coupled to their own generator, the generators located towards the center of the power van. The sea level one hour rating for each engine was 735hp at 850rpm, but due to the summer heat and the 3,000' altitude worked by these 'fourgons' derating took place to 665hp at 850rpm. Cylinder size was 9.85 inches by 12.6 inches (250mm x 320mm). They are exhaust gas pressure charged by Sulzer equipment, the turbo charger shaft having plain bearings. The power units were built at the CCM-Sulzer works at St Denis, being similar to those units then being built for the CIE by Vickers Armstrong, Barrow. If desired one generator could feed all four traction motors. The power units were carried in a body 69ft 9in long (21.2m) over headstocks & 74ft (22.538m) over buffers. The two three axle bogies, wheel arrangement A1A-A1A, are pitched at 44ft centres (13.4m), the driving wheels had a diameter of 36in (914mm), the center axle diameter was 32in (810mm). Bogie wheelbase was 10ft 2in (3.10m). The traction motors were force ventilated. They included a new method of field weakening by means of a shunt motor specially excited. The mechanical portions were built by De Dietrich at their Reichshoffen workshops. These 'fourgons' were intended for use in hauling heavy passenger and freight trains, being designed for a maximum service speed of 81mph (130kph). Weight in full working order, including fuel and boiler water was 85 tons, maximum gross weight was 88.5 tons, assuming a full load of luggage, parcels, mail & light freight. Normal schedules called for trailing loads of several hundred tons weight, the faster schedules were limited to 150tons trailing load. Steam heating equipment centred around two Vapor exhaust & oil fired boilers with an evaporative capacity of 500lb per hour. Boiler fuel carried was 48.5 gallons (200 litres), boiler water 485 gallons (2,000 litres). The units initially worked the stainless steel 'Inox' trains between Algiers & Oran, covering the 262 miles in five hours with seven intermediate stops. The train usually consisted of five coaches (approx 150 tons). They later moved to cover the Algiers to Constantine (287 miles) & Bougie (162 miles) services. The Constantine line reached a maximum height of 3,500 feet. They would also fill in on the general passenger work on these routes. They were intended to haul 485 ton freight trains at speeds up to 90 kmph (56mph) on the level. For this service a special vehicle was envisioned to be attached next to the fourgon and have two traction motors fitted, the motors being in series with those on the fourgon. It appears that these fourgons did not live up to the wishes of the operators and at least by 1960 one had been withdrawn. A factory view of one of the new fourgons. A fine view of 'fourgon' ZZDN3, date and location not known. Based on articles in Diesel Railway Traction, April 1951, June 1953 & October 1961. (Gauge 1,055mm) De Dietrich Builders Numbers 79109 - 79118, Running Numbers 060 YDA 1 - 060 YDA 10. During 1954 the Algerian Railways received ten narrow gauge units of 1,070hp for use principally on the 1,055mm (41.5in) gauge line from Blida to Djelfa, a distance of 169 miles, previously utilising four 142 ton Beyer-Garratt steam locomotives for the heaviest workings. The diesels were used to a lesser extent on the Oran to Colomb-Bechar line. This line included the Tizi grade of 1 in 37 (2.7%), which also included reverse curves of 625ft radius. The Blida route featured almost as severe grades, a 25 mile grade of 1 in 40 (2.5%), as part of a 75 mile section that gained 3,210 feet with 395ft reverse curves on the steepest of the grades. A handsome locomotive, revealing body styling influenced by De Dietrich's railcar designs, compare with the 1951 fourgon design (see above), but is there a Swiss influence in the cab front layout, particularly the windows, 060 YDA 1 above and 060 YDA 6 below. Presumably a view taken after completion of one of the locomotives. The power unit was a Sulzer pressure charged four stroke 8LDA25 built at the CCM-Sulzer works at St Denis. It's normal continuous output was 1,070hp at 800rpm but for use on the Algerian routes it was derated to 960hp to compensate for altitude and high ambient temperatures. Cylinder size was 9.85in by 12.6in (250mm by 320mm). As usual the pressure charger is of Sulzer design & build. 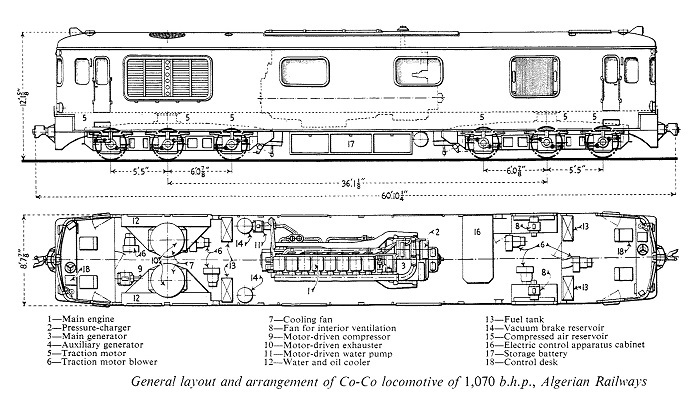 Construction followed the normal Sulzer characteristics, notably the welded framing of cast & mild steel parts, with the common engine-generator underbed as part of the integral engine framing structure. Electrical equipment was provided by Alsthom, the main generator having a separately excited winding fed by the overhung auxiliary generator through an excitation rheostat controlled by the engine regulator, a shunt winding & an anti compound winding. The anti-shunt arrangement protects against overloading in the weak field range, particularly when high tractive effort is required for long periods. The six nose suspended traction motors are force ventilated, each has its own motor blower group. Motor excitation is through two windings and the control permits progressive field shunting. All auxiliaries are electrically driven. The Sulzer 8LDA25 engine and Alsthom generator prior to installation. Mechanical parts were built by De Dietrich & Cie at their Reichshoffen works. Total weight was 71 tons, length is 60ft 10in over buffers, width 8ft 8in over cab hand rails & 12ft 1in high. Complete welding was adopted for the superstructure, comprised of two cabs, a large compartment for the engine-generator set and auxiliaries with a much smaller one to hold the steam generator. Track conditions limited the axle loading to a maximum of twelve tons. Wheelbase of the non bolster bogie is unequally divided, 5ft 5in & 6ft 1in (1650mm & 1850mm), but the pivot is carried on a welded bridgepiece above the center axle. Bogie pivot pitch is 36ft (11m), wheel diameter is 36in (914mm). The bogie has no axlebox guides of the conventional type, the axlebox castings have a link & pin connection at two points to box structures forming part of the bogie frame assembly. This method, with Silentblocs at the pins is on the principal developed by Alsthom and applied to numerous diesel & electric locomotives; traction forces are taken up through these links and bushings. The SKF roller bearing boxes have overhung laminated springs with helical auxiliaries, the outer pair on each side are connected by a short compensating lever. The hemispherical bogie pivot is supplemented by flat side bearers. The whole bogie frame is welded up electrically. One of the narrow gauge bogies. Braking is of the automatic vacuum system with two cylinders for each bogie carried on the relevent inner headstock, the vacuum produced by two electrically driven exhausters. Starting tractive effort is 38,000lb, the continuous rating is 22,000lb at 9.35mph, allowing for the haulage of 250 tons up a 1 in 40 gradient. A 450 ton train can be hauled on the level at 37mph, at the top speed of 53mph wheel rim tractive effort falls to 4,400lb. Based on an article in Diesel Railway Traction, July 1954. Page added January 9th 2004. Page updated May 4th 2007.